It was the vision of the late WBC president Jose Sulaiman to spread the word of boxing to the Inland Empire and other parts of world and to help those in need aid in and out of the sport. Back in 2008, the WBC Legends of Boxing Museum debut was led by a who’s who list of former boxing world champions such as the late Mando Ramos and Ken Norton. Since then, the event has been a draw to former prizefighters and the fans who love them. Now in its ninth annual season, the WBC Legends of Boxing Museum will induct numerous former world champions, contenders and journalists on Saturday Dec. 3, at the old San Bernardino Sun building now called American Sports University on 399 N. D Street in San Bernardino. Among those inducted this year are fighters Daniel Ponce De Leon, Israel Vazquez, Joel Casamayor, Oscar Muniz, Librado Andrade, Enrique Ornelas, Dub Huntley, Jimmy Montoya, Ben Delgado, and journalists Gene Aguilera and Michele Chong. The late great Henry Armstrong will also be posthumously recognized. He fought in San Bernardino in the 1930s. Sulaiman passed away January 2014 in Los Angeles. Though his organization the WBC is based in Mexico City he often visited Southern California and was familiar with its rich boxing tradition and rabid fan support. When it began eight years ago, two of its inductees were in ill health during a hot summer day. Ramos commented about the stifling heat while receiving the award, but was in good spirits as he received the award for his contributions in prizefighting. Two weeks later Ramos would pass away due to a heart attack. “I could have been a much better fighter if not for drinking and drugs,” said Ramos during that first event in June 2008. Drug prevention, anti-bullying and health needs are also among the concerns the WBC Legends of Boxing Museum addresses. 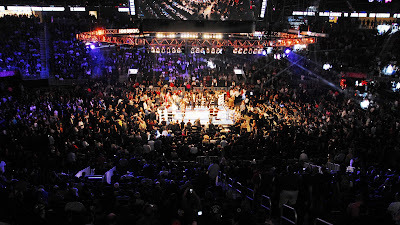 Ochoa, who also works for the Riverside Unified School District’s drop-out prevention program, said the annual event also serves as an opportunity for fans and fighters to mingle with one another freely. Among those inducted Ponce De Leon and Vazquez currently work as TV analysts for boxing programming here in Southern California. Cuba’s Casamayor works as a trainer in Las Vegas and Muniz, Huntley and Delgado also are trainers. Andrade and Ornelas are brothers though have different last names and currently work for Premier Boxing Champions promotions. Montoya trains, promotes and manages fighters. Armstrong is considered one of the greatest prizefighters of all time and lived for a short period in St. Louis before making his way to Los Angeles and eventually New York. In the 1939 he simultaneously held the featherweight, lightweight and welterweight world titles. Writers Chong and Aguilera both cover boxing in Southern California. Aguilera published a book called Mexican American Boxing in Los Angeles. Chong has covered amateur and pro boxing in the Southern California circuit for more than a decade. All will be attending the event that begins at 1 p.m. on Saturday. For more information call (951) 378-9634.